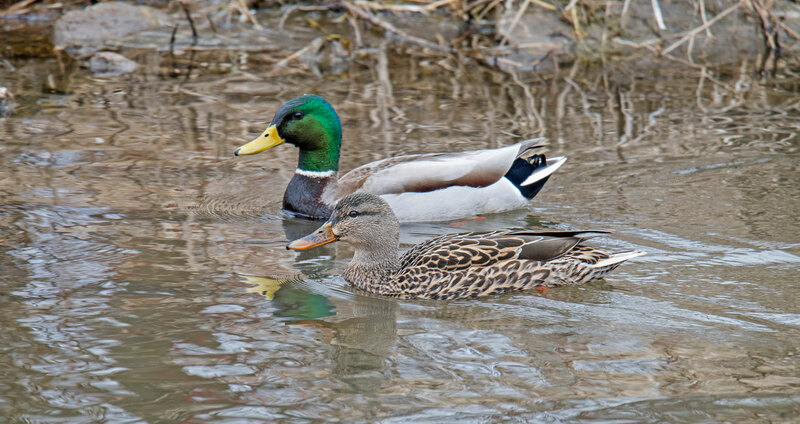 I noticed a couple of very cooperative Mallard Ducks at Gilbert Creek. Normally they flay as soon as the see me. Both the male and female took turns posing of a rock. These are some of the best shots I’ve gotten of mallards. 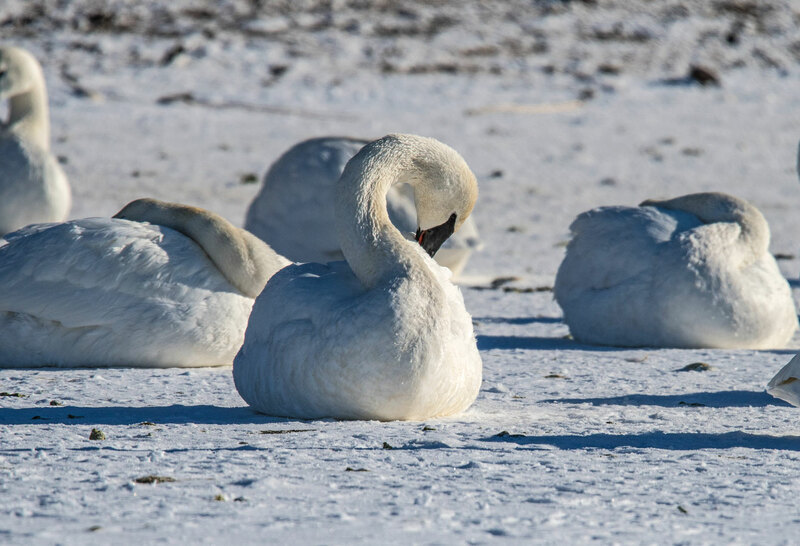 We had some shopping to do in Hudson, Wisconsin so we decided to stop in and look at the Trumpeter Swans that can be found along the Saint Croix River. We were disappointed and a little shocked to find that there was almost no open water where the Swans usually congregate. There were a few of them huddled along the shore and another batch out toward the river but none in the little pond. I’m not sure what is going on. Normally even if it is cold out there is a nice section of open water in the area. I did manage to capture a few shots of the Ducks and Geese near the puddle of open water. Spring is the time I like to drive over to Gilbert Creek Wildlife Area to view the birds. We had driven past last week and noticed that there were already a number of Sandhill Cranes in the area. I drove down just after sunrise and didn’t see much to photograph. Later in the morning we were in the area so we drove over to see if things had improved. Just as we arrived my wife noticed a couple of Sandhill Cranes calling. There was another pair in the wetlands but we couldn’t see them. There were quite a few Red-winged Blackbirds around but we didn’t see any females. Lots of Canada Geese in the pond. There were also quite a few ducks around including this pair that seemed to be staking out a nesting place. There were also a number of Wood Ducks around but they were a little skittish so no photos. When things get a little dull I like to take photos of just about anything. This is last years Cattail. Last week my wife and I had a meeting in Duluth and on the way up we decided to drive through Crex Meadows. I wasn’t sure what we would find because the Crex Meadows Website hadn’t been updated since January. We were very pleasantly surprised at the number of birds we saw. Large numbers of Sandhill Cranes in the flowages. We were watching these two Cranes when we notice a Bald Eagle flying toward us. He was busy hunting and wasn’t paying much attention so I managed to get a few shots of hunting. He managed to catch what appeared to be a small fish. Shortly after catching it another Bald Eagle flew into the area and he quickly joined it. This one appeared to be not a fully mature eagle the second on was a mature eagle. There were also large numbers of Trumpeter Swans already staking out their nesting territory. These two were right next to the road. The water was still frozen and one of them was having trouble paddling through the ice. 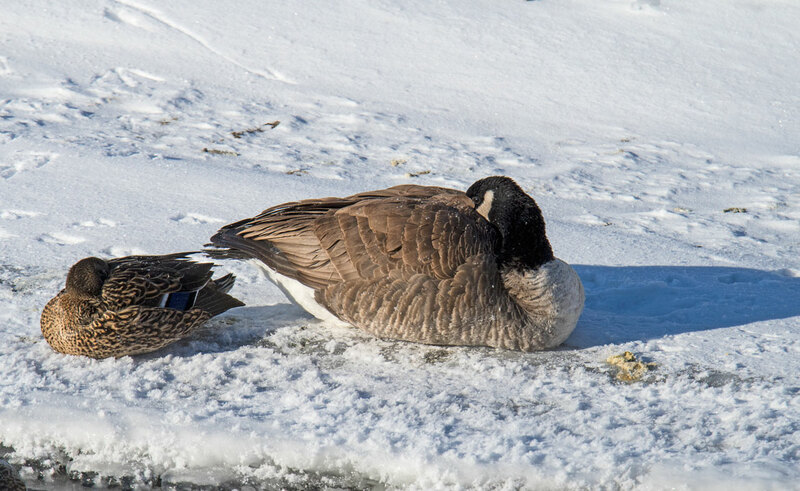 There were also a large number of Canada Geese in the flowages. There were far more geese that I’ve seen for quite some time. It many be that they are just passing through. These two looked like they were staking out a nesting site. There were also a variety of ducks in the flowages. They seemed to be the most timid waterfowl and generally fly before I can get a photo. I was happy to capture a female Mallard and a female Hooded Merganser before they took off. In addition to Trumpeter Swans there were also quite a few ducks along the Saint Croix River. Someone must be feeding the ducks because this one walked right up to me. I spent more time than I intended photographing the wildlife. My wife went for a walk while I was taking photos. It was really cold out and I started to get cold even with my cold weather gear on. I thought maybe she had walked back to town to do some shopping but when I finally returned to the car she was at the car and had been for some time. A small communication problem. The ducks were more active than the Swans. There were multiple flights of ducks arriving at small area of open water as we watched. We stopped in Hudson, Wisconsin to check on the Trumpeter Swans that winter on the St. Croix River. I has been warm and there were fewer swans than we typically see. We did notice open water out in the river and there were quite a few swans on the Minnesota side of the river. That group was particularly active and I was able to capture some photos of them landing near me. The Mallard Ducks were also active. I captured this sequence of photos as one landed in the water near me. 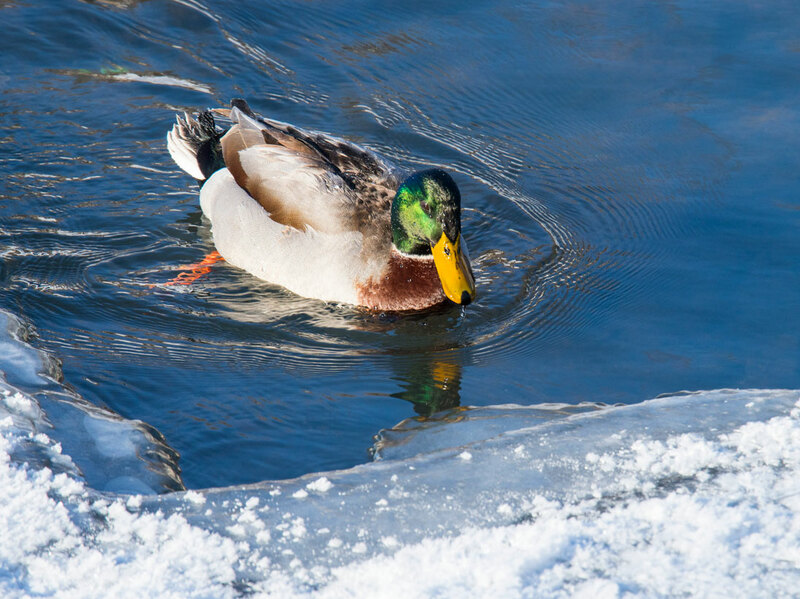 I also captured a sequence of photos of a Mallard Duck taking a bath then exiting the water. After leaving Willow River State Park we headed over to the Saint Croix River to see if there were any Trumpeter Swans overwintering. The Saint Croix was frozen and there were quite a few swans around. It was another grey and overcast day so the photography was not all that great. While we were there we met another photographer and his friend. His friend happened to be a Mallard Hen. 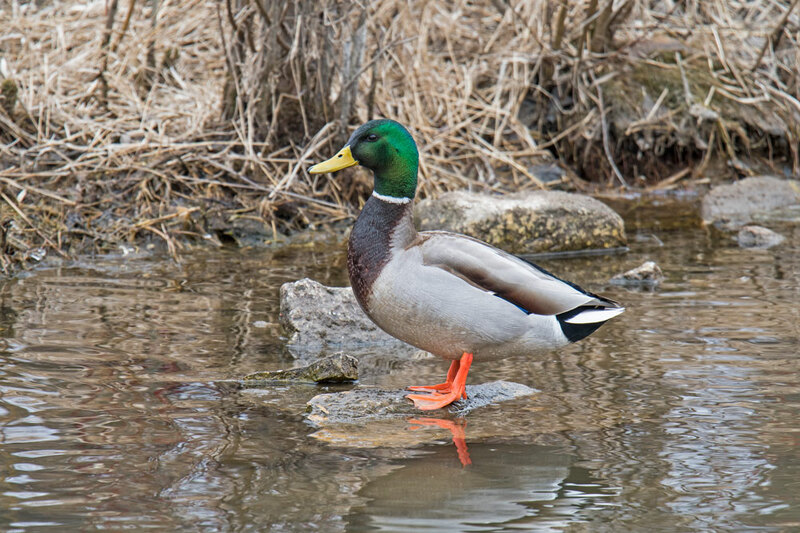 He had been photographing for quite a while and the Mallard followed him everywhere. 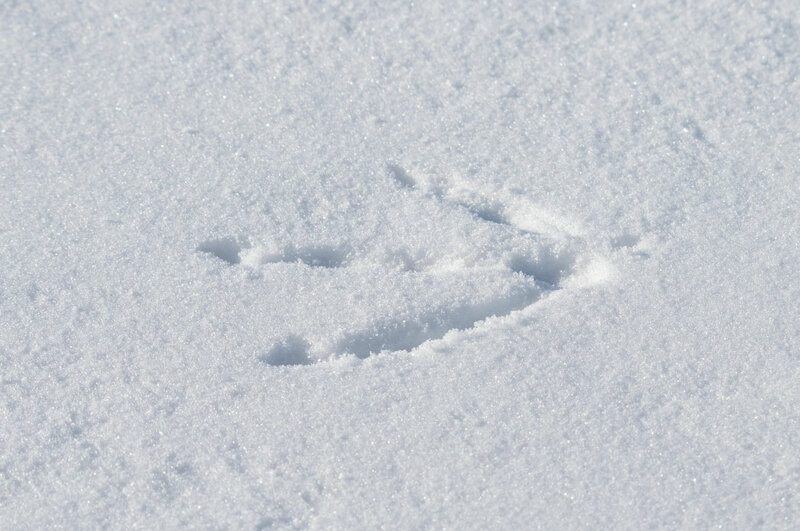 When we were in Duluth Looking for the Ivory Gull we encountered a variety of birds in Canal Park. My wife and I drove down to Red Wing earlier this week. For several days the temperatures never reached above -10 and we were getting cabin fever. When the temperature reached 0 we were out of the house. Actually the temperature rose to 24 during the day so it seemed like we were in Florida. The wind was blowing in the afternoon so it was still cool but not as bad as the -35 wind chills that we had the previous days. We had lunch at Libertys Restaurant & Lounge in Red Wing. They had a great salad bar with soup, sandwiches, pizza and salad. It was more food than we could eat and it was just what we were looking for. Red Wing is definitely a place we want to return to and explore when the weather gets warmer. We drove over to Colvill Park, which is just south of town off of highway 61. As soon as we drove into the park we started to see Bald Eagles in the trees. I jumped out of the car and tried to photograph one in a tree just ahead of the car. It started to fly just as I took the photo. We counted 8 in one tree. I was able to get close to one and get a nice photograph. There were a bunch of other photographers and some walkers around so as soon as an eagle would land they all headed for it. Needless to say the Eagles didn’t stay around long. 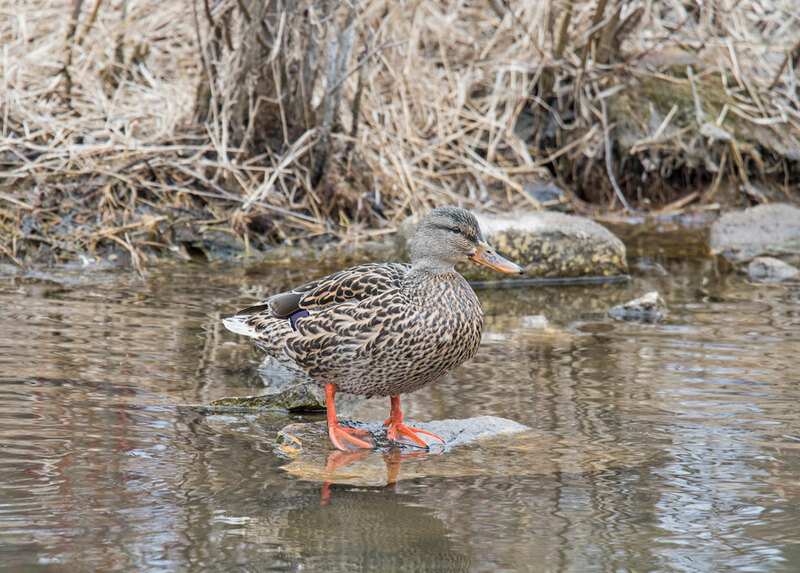 There were also a variety of ducks around that provided entertainment between photographing Eagles.